We came home to hay down in the field. Sunday it was baled and the wagons were bought into the barn. Unloading hay is messy, dirty work and doing it on the hottest, most humid day we have had this summer doesn't make the job any more enjoyable! My oldest daughter is home on a summer break from college, she volunteered to help. It has been about 5 years since she has participated in putting up hay. It took her back pretty quickly to the days when her and her sisters unloaded wagons of hay every summer. I can't believe all of that work didn't help build the work ethic they have today. They were some tough little girls! We only managed to get one wagon unloaded, two more to go. I just keep reminding myself how satisfying it will be to have all of the hay we need for winter stacked up in the barn in July. A much better situation than we were in last year. Oh yes I agree farm work certainly does build work ethic, my girls are strong hard workers too.Nothing says welcome home better than dirty hay work:) I am sure she loved every minute. Oh I know this feeling ... you sleep good that night . Handling little square bales is not a fun job. I am glad that you have hay and next winter stacking all those bales won’t seem quite as bad as it does today. It sounds like you have some awesome help! We have considered Round bales as we grow in livestock numbers. You just have to have the equipment to move them! Yea, hay is so much heavier to unload and stack compared to straw. 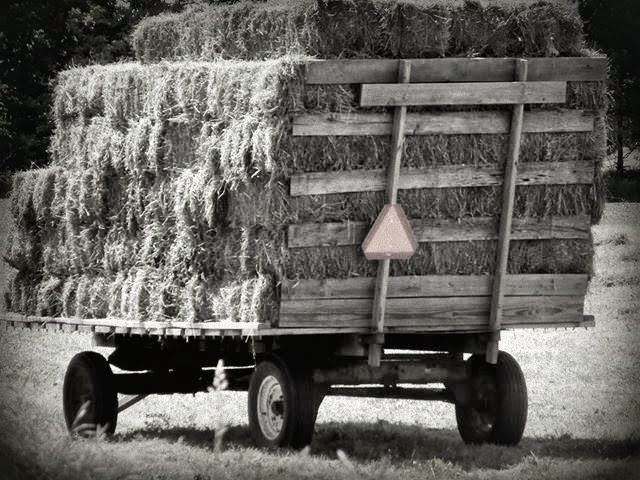 Wow this threw me back to being a kid hauling hay for the horses. Yep, it is hot, dusty, dirty, and you get hay chafe where you never ever want it. But it feels really good to sit down with a big jug of sweet tea and an icy cold watermelon to take a break. It feels even better to see the stack in the barn and know that your animals will be okay in the coming winter. Thanks for the good memories of stacking hay with my dad. I can't imagine how hard this work must be! Especially in the hot, humid days of summer. But I bet it is a great feeling once it is all done and ready to go for winter! I have a teenage daughter that helped her dad last night. She said she could feel the burn...best workout ever! I had to laugh :) I am never that optimistic about it! I haven't hayed for years. It is hot, sticky work, but it sure feels satisfying to get it done before rain ruins it and know that the animals will be well fed off your labour come winter.